It’s Mixology Monday again, and this month those who like to blog about ‘craft cocktails’ are taking on the very ingredients that the new cocktail movement was a rebellion against. 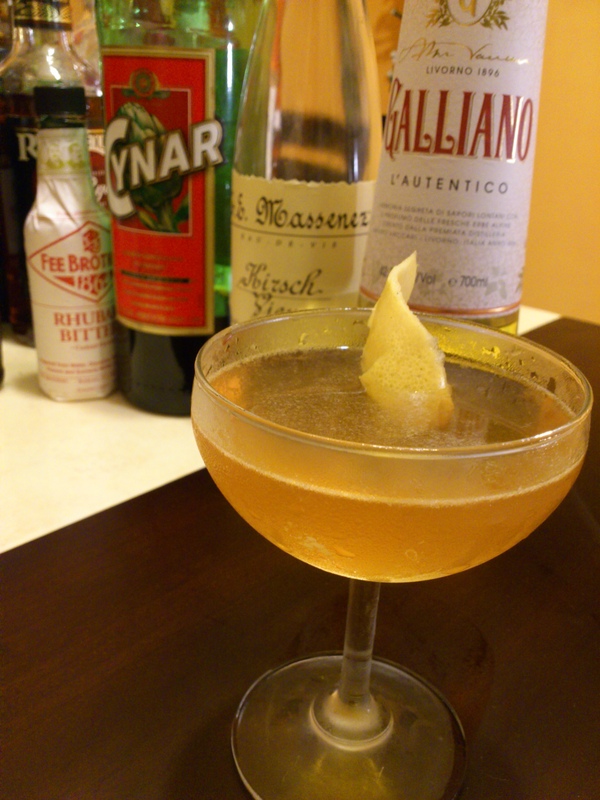 “The evolution of the cocktail has been a wondrous, and sometimes, frightful journey. From its humble beginning, to the “Dark Ages” of most of the later 20th century, to the now herald “Platinum Age” of the cocktail, master mixologists and enthusiasts alike have elevated its grandeur using the best skills, freshest ingredients and craft spirits & liqueurs available. But with all this focus on “craft” ingredients and classic tools & form, it seems we have become somewhat pretentious. The focus on bitter Italian amari, revived and lost ingredients such as Batavia Arrack or Creme de Violette, the snickering at a guest ordering a Cosmopolitan or a Midori Sour; has propelled us into the dark realm of snobbery. Many scratch bars and Speakeasies have gone as far as to remove all vodka and most flavored liqueurs from their shelves. Some even go as far as to post “rules” that may alienate most potential imbibers. Remember, the bar was created with pleasing one particular group in mind: the guest. As such, this month’s MxMo LXXI theme, From Crass to Craft, will focus on concocting a craft cocktail worthy of not only MxMo but any trendy bar, using dubious and otherwise shunned ingredients to sprout forth a craft cocktail that no one could deny is anything less. There are a plethora of spirits, liqueurs and non-alcoholic libations that are just waiting for someone to showcase that they too are worthy of being featured on our home and bar shelves. So grab that bottle of flavored vodka, Jagermeister, cranberry juice, soda, neon colored liqueur, sour mix or anything else deemed unworthy of a craft cocktail, and get mixin’! Well, I wasn’t feeling inspired to join in this month until the looming figure of my overly tall Galliano bottle caught my eye. “I actually quite like Galliano”, I thought. But it is terribly sweet. So I thought about what might be a good base spirit to mix it with and decided on a newish addition to my liquor collection, Kirsch (aka Kirschwasser), a brandy made from sour cherries. Kirsch (or at least the brand I have, Massanez) is delicious, but very dry, so I figured it would balance the sweetness of the Galliano and vice versa. A little taste test bore this out, but it was thin – all high notes, needing some depth and body. To try and add this without sweetness, I turned to my favourite artichoke liqueur, Cynar, and a bit of Fees Brothers Rhubarb Bitters, a flavour that I am very fond of. The resulting cocktail was good, but then I remembered thinking that grapefruit would go nicely with dry eaux-de-vie such as Kirsch. The addition was an improvement, so after a quick suitably smutty 80’s name, this is the result. It’s not perfect, but I think it’s a pretty good drink. Delicious even. Shake and strain into a coupe. Garnish with a twist of grapefruit. Stick on some Human League and consume. I also like Galliano. Too few cocktails use it so it ends up just sitting around. The fact the recipe has changed over the years also confuses things. Though apparently the current version is back to the original recipe again. Thanks, Seamus. I thought the recipe may have changed, but wasn’t really up for a big research and write about Galliano post. I’m sure there’s some interesting history there though. Thanks Putneyfarm. I’d be thrilled to know what you think. I liked it, and my wife liked it, but I can’t really call it great. I’m sure it could be improved. Thanks a lot, Stew. Lovely photo. Did you like the drink?